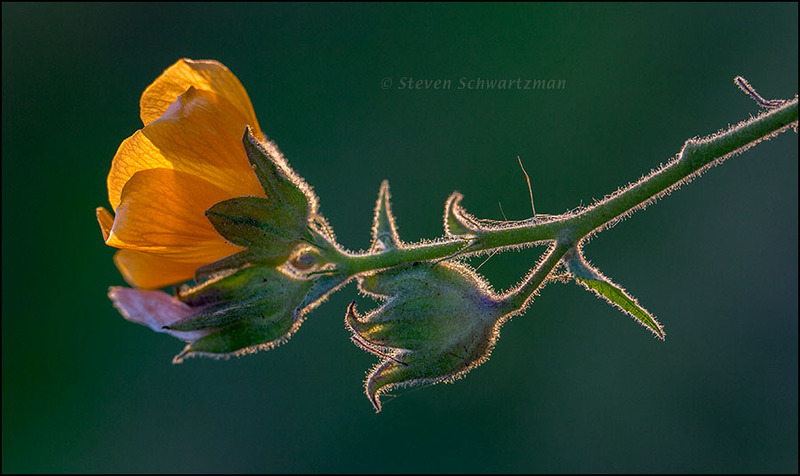 From late in the afternoon on December 26th, 2014, at the Arbor Walk Pond, here is a flower of Allowissadula holosericea, known as velvetleaf mallow. The species name holosericea means ‘all silky,’ a characteristic you can confirm in the contour of soft hairs rendered conspicuous by the backlighting of the soon-to-set sun. Very gentle low light in winter, beautiful. Hello, Emma. This wildflower was all the more valuable for being in winter (even if our winters are much milder than yours in the UK). I had a floral engagement and I kept the appointment. I don’t remember seeing this particular blue-green (almost teal) as a background in any of your photos. It’s lovely, and beautifully complements the color in the sepals (?). After days of drizzle, rain, and near-zero visibility because of fog, it’s a welcome sight. I also noticed the unusual background color, but I don’t know why the out-of-focus vegetation came out the way that it did. According to Geyata Ajilvsgi in Wildflowers of Texas, in the petal~sepal~tepal contest, the winner for velvetleaf mallow is petal, of which there are five yellow-orange ones. Reference books are great (except when a piece of information is nowhere to be found or when a statement in one source contradicts a statement in another). I wanted to go back the day after I took this late-afternoon picture, but the weather over the next two days was bad. Finally we had some sun on the 29th and I returned, as you’ll see next time and two days later. A wonderful photo, Steve. The peach accents the green-blue background so nicely. It also makes a nice counterpoint to the dusting of snow I awoke to this morning. Thanks, Melissa. If only we’d gotten a dusting of snow here on the 26th, I could’ve photographed it on this flower; that would’ve been an unusual bit of counterpoint. Please do, but set it to last only long enough for some good picture-taking. We’re supposed to get to 60° and some sunshine this afternoon. Then don’t muck around, but come on down! I love its hairy silhouette. Colors are fantastic as well. On the first count, I can confirm that it takes after its photographer. I’m coming back, because I really do love this shot. So pretty! Been away from blogging. Crazy busy with home school. I have dreamt of this flower. You’re welcome to come back and visit whenever you get the chance. Well, then how about a third time? This really is one of my favorite flower portraits on your blog. And it doesn’t even have an insect on it. How good of you to come back yet again—even sans insects. By then the sun had sunk almost behind the buildings and terrain across the way (in fact it disappeared a few minutes later), so the low angle of the light lit up the contours of the mallow. We tend to think of flowers rising from a plant, but it’s fairly common for flower-bearing branches to go sideways as well. I was happy to put the horizontal orientation to good use here. Plants are opportunists. Several of my Orchids have grown their spikes out horizontally, and there are plenty of species (though I don’t have any) whose flowers are pendant. Nice that you chose this orientation. You know I may have guessed that was a morning or early afternoon shot. I think I’d be excited once the sun was down that I got the shot!! Plants are definitely opportunists, and sometimes photographers are too. I’d gotten a late start that afternoon and I’d already spent time walking all the way around the pond and photographing a few other things when I happened upon the mallow. I used the remaining three or four minutes of light to take a bunch of pictures, some of which didn’t turn out well, but one success is all that matters. So true, photographers are opportunists by trade! And yes that “money shot” can be all you need for the day. That’s an interesting picture for sure! There’s a lot of plants that have flowers that do not resemble flowers. Then there’s those flowers that actually stink, which I’m learning is not exactly uncommon in Orchids. Nor is it uncommon for flowers not to smell at all. They’re all so different, just makes them even cooler! As you say, flowers come in a huge diversity of shapes, sizes, components, colors, and smells. The more for me to photograph. You couldn’t ask for better lighting! Beautiful shot Steve! Thanks, Michael. I lucked out with the lighting, but I had to be quick to use it before it disappeared a few minutes later. Happy New Year Steve. A beautiful piece, outlined in refracted light. It’s great that Austin is far enough south that we have a few wildflowers even this early in the calendar year. Thanks, Jim. Good to hear from you up in north Texas. Truly amazing…Love the subtle back lighting and the color is stunning. I’d say I managed to get a good combination of form, lighting, and color in this one. Not bad for a flower in winter. I’m glad it wowed you. You’ll get no argument from me, David. Me too, Nora: the soft hairs made the backlighting especially effective here. It’s not just the flower, it is the flower in the light. Beautiful, Steve! Hi, Lynn. I agree that the two things worked well together here. I definitely lucked out on the timing. What a marvel. So striking against the backlighting, and yet so delicate and tender looking. The extent to which the low light lit up the contour of fine hairs surprised me, but of course as a photographer I welcomed that kind of surprise.